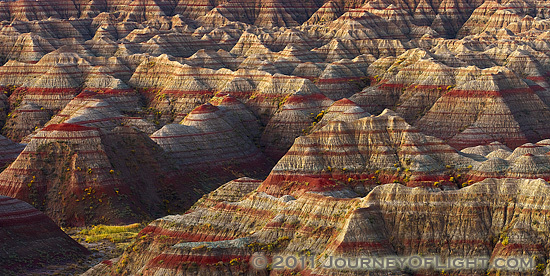 Badlands National Park is a playground of shapes and forms, patterns and colors. Whenever I visit I explore these rock formations with a longer lens to capture a more intimate view of the park. The light was especially nice on this morning giving a warm pre-sunrise glow. To see what this area looks like from a wide-angle lens check out Morning Illumination taken 2 years previously. On the right side of that image you can see the area on which I chose to focus for today’s post. I also decided on the panoramic view because I felt the wide horizontal lent itself well to exploration of the shapes and colors in this image. 2 Responses to "Photo Friday: Wary Witnesses"